Did you know that cervical cancer can actually be prevented? One of the ways this is possible is through a simple, routine, smear test; and yet over one million women are failing to attend their screenings. Many worry that it might hurt, don’t think it is necessary or are embarrassed to go along, so Jo’s Cervical Cancer Trust – the UK’s only dedicated cervical cancer charity – are aiming to raise awareness about the simplicity of the smear with a new campaign. 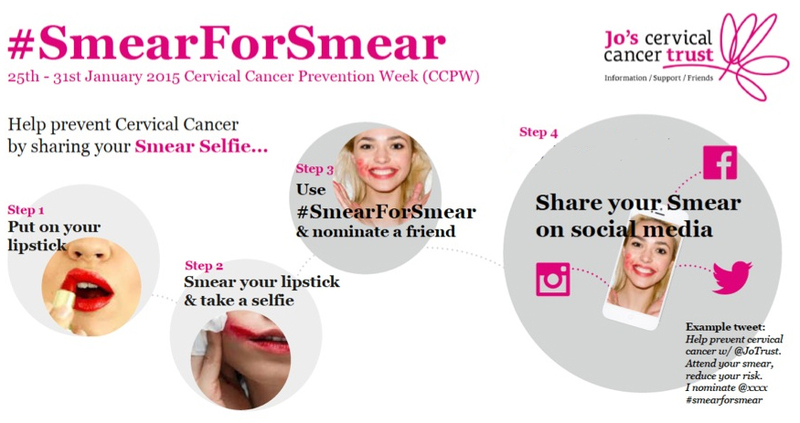 Launched at the start of Cervical Cancer Prevention Week (25th – 31st January 2015), Jo’s Cervical Cancer Trust is asking the public to join #SmearForSmear – a social media initiative which wants to draw attention to the importance of smear tests and try to stop the rise in numbers of women diagnosed with the disease.